Remember the lamb? Well the bones are in the bin, but the rest has been subjected to the recycling queen (me). In fact it is now on its way into a cannelloni dish, via a great stock. Let me tell you the recycling story! Most prepared pieces of meat may have several culinary lives. The lamb prepared, was great and succulent, after 5 hours and 30 minutes on low heat. I and my guests enjoyed the chunk. The day after, I peeled off the rest of the meat. I prepared some with some Jack Daniels barbeque sauce in the oven, with some leftover potato dauphinoise. The rest of the meat is now in the freezer, i.e. the meat that was peeled off. But there was more meat to enjoy on the carcass itself. So I chucked the bones, two carrots, two stalks of celery, one red onion, in a large pot, and added water and salt. And then I added a bag - of herbs!! The cute packages of herb is certainly not a Norwegian invention. Far too inventive! I bought these three boxes of herbs in a bag in Marseilles. 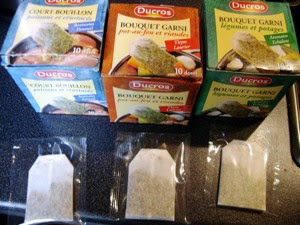 Ducros has made individually packed bags of herb mixes for fish and crustaceans, vegetables or meat casseroles. So I took one intended for meat casseroles and added to my stock. This is another lazy dish, as I left the stock over a very low heat for three hours. I took out the bones and removed the meat, and when it was cold I placed the meat together with the boiled vegetables in a zip-lock bag. And the bones flew into the bin. I try to figure out what to make from the recycled lamb. I found out that I would make cannelloni with a meat sauce, and step one would be a lamb ragout. What better to use than the leftover meat and vegetables. I chopped four fresh tomatoes and heated them in some very hot olive oil. 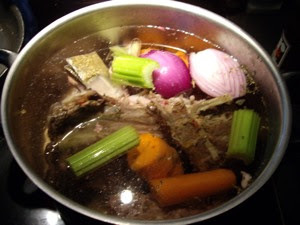 I added the boiled meat and vegetables, 1/2 a small can of tomato pure and 4 ladles of stock. As the secret of a good ragout is the balance between sweet and salty I added the necessary amount of salt and sugar and some Italian herbs. 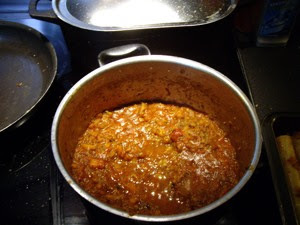 Then I allowed the ragout to simmer until most of the liquid had evaporated. 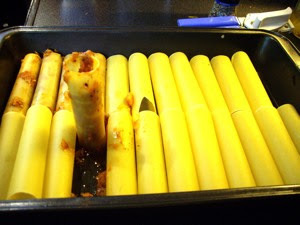 Cannelloni are small tubes of pasta filled with different sauces in the tubes and topped with sauce and cheese and then baked in the oven. 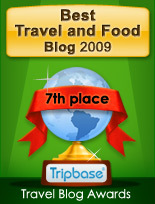 I use to make a Cannelloni Tricolor, i.e. filled each 2nd tube with either meat sauce or wilted spinach. Then use a white cheese sauce on top. I had no spinach today, but started to fill each tube with the ragout. This is rather time consuming, but absolutely worth the hard labour. Another delicious filling is a mix of spinach and ricotta cheese seasoned with salt and pepper. The you add tomato sauce on the top. 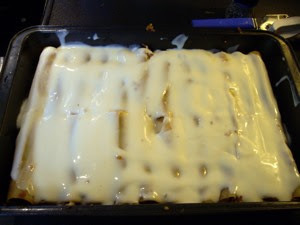 But I topped the cannelloni with 40 cl bechamel sauce. I used pre made, as this is a non-gourmet, lazy everyday dinner. I personally thought that the Dolmio bechamel was a little too sharp for my taste, but I poured it out of the glass and spread evenly on the top of the pasta. And 200 grams / 7 oz grated mozzarella. 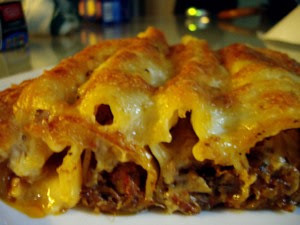 A once-upon -a-time-roasted lamb, recycled into a stock, then into this delicious cannelloni dish. And it tastes so much better than the thing you find in the supermarket, and it is 100% made from scratch. 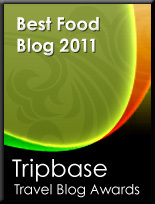 No additives - it is good for you! !